The man who did backhoe work at my house this summer walked in one day recently and handed me three packages of frozen venison meat from a deer he hunted this year. He said he knew I liked to smoke things, and that this was “backstrap” venison. I wasn’t quite certain what that meant, but I thanked him, put two of the parcels in the freezer, and one in the refrigerator to defrost. It’s way too cold to smoke anything outside right now, but I wanted to try some of the venison, since I rarely get any (despite all the deer on my property eating my roses). The frozen package looked like a roast, and I was envisioning some sort of hearty stew. Imagine my surprise when the lump of meat defrosted into very thin slices. Now this presented a cooking challenge. I have fond memories of a dish my mother used to make that we called “rolled steak.” It was thin slices of beef stuffed with chopped onion, placed on more onions, and slowly cooked on the back of the stove for several hours. I think the only seasonings were salt, pepper, and garlic powder. To me, as a child, this rolled meat dish seemed very fancy – although I now realize my mother was making inexpensive, tough meat stretch to feed our family. That dish seemed a little too timid to use with the venison, but I liked the idea of the rolls. 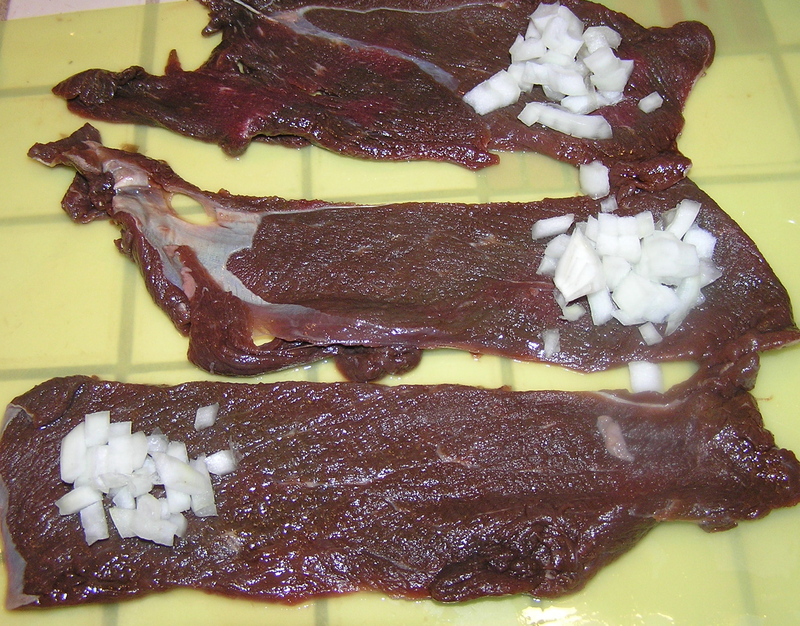 Venison is very lean, and takes well to long slow cooking that won’t dry it out. I decided I wanted something with a bit more spice and smoke than my mother’s plain rolls, and preferably cooked in the slow cooker since I had to go out later that day. This dish is quite spicy, although the sour cream tames it a bit. You can vary the spiciness by the amount of chili garlic paste you use. Place sliced onions, garlic, and mushrooms in the bottom of a slow cooker. 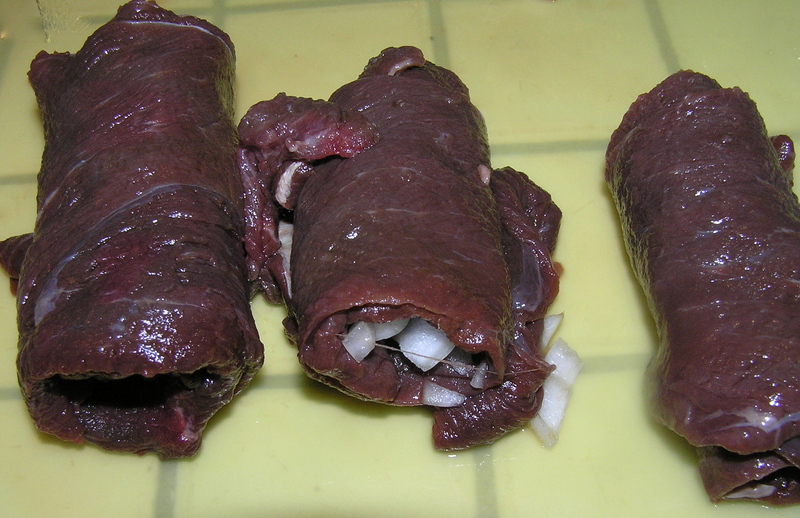 Roll venison slices around onions, placing rolls seam down. 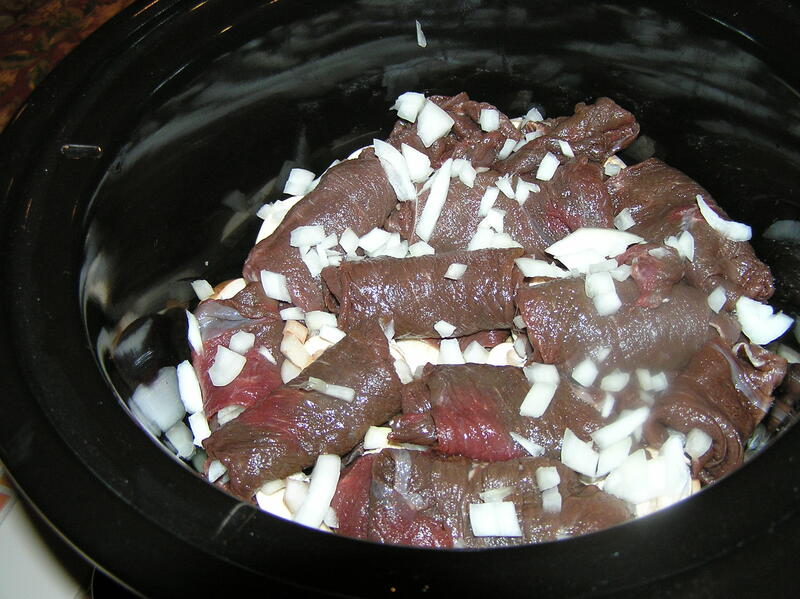 Place venison rolls in slow cooker, seam down, on top of the vegetables. Sprinkle any remaining diced onions over the rolls. In a medium bowl, stir together ketchup, Worcestershire sauce, soy sauce, chili-garlic paste, water, salt, and pepper. Pour over the venison. Cover the slow cooker and cook on low for 4 hours. At the end of the cooking, stir in sour cream. Makes 4 servings at about 3 grams of fat/serving. 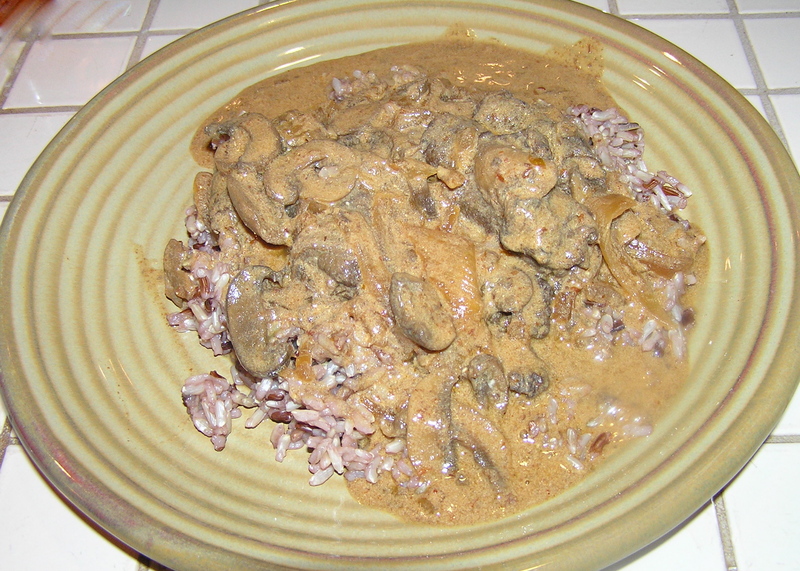 This venison is pictured served over mixed brown and wild rice, which adds about a gram of fat/serving.